Creative people seldom have time to do the press they need to, too busy creating. My focus is technology and Creativity especially in the local realm, and I seek to test how it can be leveraged. Since 2003 that has meant a self funded project, a focus on what locals have access to and little room for Press agents. It’s easier to scale up. 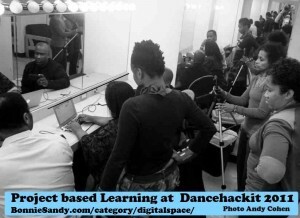 In this case I collaborated with Ms Marlies Yearby the Award nominated Director of the original Broadway Musical “RENT” for what we called Dancehackit. as the tech end of this i was introduced to “the Backend”, which is where I saw that technology could really contribute. we used a Posterous9now defunct) Google docs and groups to collaborate but there was so much back-end stuff, which kept taking up so much time and honestly is part of the reason I have NOT revisited this project. I’ve had the opportunity to test many theories of technology and creativity.This type of hands on exploration also needs to be supported. what we discovered is invaluable to the shaping of a final product. We used live stream see some of the highlights here and a quick overview of our other endeavors below. With longtime Veteran actor of stage and screen Victor Arnez teh exploration was much quiter and more intimate… a former video production instructor at The local (Brooklyn) public Access Tv responsible for training producers at some of NY’s leading television channels, his involvement meant exploring the possibility for local theater, turning living room and lofts into “stages” for show, tell and sale. were were able to look towards equipment and props and truly look at the scalability of the event. The final case was a local off Broadway production. This Time I was approached about 3-6 weeks before the event You need six months to fully plan and execute a strong social media strategy. here technology was used to make up for lack… The site (A responsive wordpress theme, became a digital playbill and was accessible by mobile. They set up a FB group vs a page which allowed cast to share and become active in spread the word and building support. We used Eventbrite as a digital ticketing system. The did a trailer ad on Youtube and took to tweeting. Small productions have a manpower challenge and so Social media may not be a natural fit unless it’s on a volunteer basis as EVERYONE was too involved with production to tweet. I’ve discussed streaming and on demand video for preparation, performance and archiving and merchandising. In most cases it is “CULTURE”, what’s traditional in that niche that is a challenge. These as well as revenue models need to be written into contracts at the time cast is signed on The language of many of the current social media sites also make IP conscious creative uncomfortable. Posted in Latest and tagged Creative Industrialism, Digital Space, FAME, Social Commerce, Steamed.